It has been said that there are no embarrassing questions, only embarrassing answers. That may be true. But if that's the case, why do we always blush when we ask the questions? Warning: This article may be difficult reading for the faint of heart. Be sure to eat some chocolate before you begin. It won't make you any less embarrassed, but don't we all need a little more chocolate in our lives? 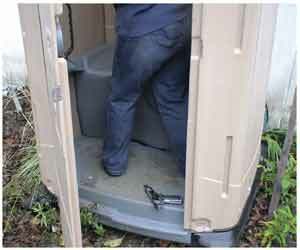 If you shoot very often at an outdoor range, chances are that at one time or another, you will have to deal with a portapotty while you have a gun on your hip. This is risky business, ladies--take it from someone who knows. What's the risk, you ask? Well, a friend of mine once entered a portapotty during an IPSC match. She was carrying a Glock in a kydex holster which had a very open front to allow faster speed draws. The Glock was unloaded, per IPSC rules. She closed the door to the portapotty, began unfastening her belt and the firearm jumped right out of her holster and landed, KER-PLUNK, in the slime. Ewwwwww!! Even for those of us who rarely carry in open front holsters, range portapotties pose an annoying risk of dropping magazines, speedloaders, pocket knives, flashlights, and anything else you might fasten on or near your belt while hanging out at the range. The more crud you somehow end up carrying, the more likely it becomes that whatever you're carrying will end up in the crud. Open lid, sit down, do whatcha gotta do. Stand up and close lid. Then pull your trousers back up. If the portapotty is so primitive that it does not even have a lid, you can instead turn to face the toilet while lowering your trousers. This reduces the risk of things dropping off your belt in the first place, and improves your chances of a last-gasp save if something other than the gun does jump off your belt. Remember not to grab for a falling gun! That can be dangerous. If portapotties pose problems, public restrooms do, too. There's still the risk of dropping your gun into the toilet. But there's also the added risk of getting discovered carrying while you're at it. What's a woman to do? First and most important, remember that you are not breaking the law. Engrave that message firmly on your conscience so you don't make a Silly of yourself. People tend to notice, in a vague sort of way, when other people are putting out emotional vibes. The stronger the vibes, the more they notice. If you're new to carrying and are not quite sure how you're going to manage this discreetly, remind yourself that you're on the sunny side of the law and have nothing to fear. Don't put off those vibes if you can help it. Never, ever, ever, ever take the stall next to a small child. Little kids are too likely to look under the stall and then comment (loudly) about what they see. If the gun is on your right hip, try to take the stall with a solid wall on the right side while you're sitting down. If the gun is on your left hip, take the leftmost stall. End stalls have the least walk-past traffic, and with a wall on your gun side you've eliminated the chance of someone spotting it from the next stall. Keep the gun inside its holster if possible. That's where it belongs and that's where it remains most safe. Try rebuckling your belt around your knees before you sit down. This keeps the holstered gun safely above the lowest edge of the stall door. If you appendix carry, you may instead simply keep one hand on the holstered gun, holding it and the top edge of your trousers at knee level while you do your business. Before exiting the stall, put yourself back together as well as possible. Try to avoid exiting the stall while there are other people in the common area, because you'll need to check your entire outfit in the mirror to be sure you have no odd lumps or other concealment challenges going on. That's always a bit easier to do if no one is around to watch you correct the problem. If you do spot a problem while others are around, you can usually step back into a stall to fix it discreetly. When fixing your hair and makeup, keep your gun side elbow slightly below shoulder height so your cover garment does not ride up. If you absolutely positively cannot figure out how to use the toilet with the gun remaining on your belt, you can instead remove the holstered gun and stow it inside your purse temporarily. Do not take the gun out of its holster, because less gun-handling means less opportunity for an unfortunate mistake. With the trigger and trigger guard remaining securely covered by the holster, there will be no real risk of a noisy mishap. Women who are not well-endowed probably will not understand this one, but some curvaceous types have a minor but annoying difficulty when learning to safely place the gun into a holster. What happens is that a new shooter generally needs to see the mouth of the holster in order to avoid blindly probing for it with the muzzle of her loaded gun. Looking the gun into the holster at first really helps your hands learn where to safely find the holster without looking. But some women's figures make it impossible to look directly at a side-riding holster unless they first reach up and shove a certain paired body part out of the line of sight. You can begin to practice safe holstering at home with an unloaded firearm. After you look the gun into the holster enough times, finding the mouth of the holster will become second nature and you will rarely have to look unless something goes awry. While it is good to learn basic holstering at home where there are no prying eyes to see you feeling yourself up, eventually you will need to use your holster when other people are on the range. Avoid having to look as much as you can, but if you do need to look, go right ahead. Don't give off those embarrassed vibes if you can help it, just matter-of-factly do what you need to do. There is one time when it will always be necessary to look, and that is when you encounter some unexpected difficulty getting the gun into the holster. If you think you've got the right spot, but something "feels wrong" or the gun seems to be hanging up on something, STOP. Do not keep pushing the gun downwards because that could be dangerous. Instead, lift the gun upwards and get the muzzle pointed downrange. Make sure the holster mouth is clear of obstructions before you try again. To avoid getting obstructions in the first place, after each time you put the gun into the holster, carefully sweep the flat of your hand along your side next to the holster. Then tuck in any loose material your hand encounters. This makes sure that your shirt won't get tucked into your holster along with the gun while reholstering. So, work with the unloaded pistol at home as much as you can, until you are able to reholster safely without looking. Sweep and tuck each time you holster. And if you find yourself on the range one afternoon with a choice between poking the muzzle of a loaded gun around your midsection, blindly probing for the holster mouth, or flopping the ladies out of the way so you can see where the muzzle needs to go, well, make the safe choice, okay? This one's really fun. You've signed up to take a basic handgun class designed for concealed carry. Among the topics taught in the class is how to safely draw and reholster your firearm while wearing a cover garment. So what should you wear to the range? That's entirely up to you, of course. But if it were me, no matter what else I wore, I'd be sure to wear a nice long undershirt which tucked in very securely. Because when it is time to learn how to draw from concealment, several of the basic techniques involve grabbing a handful of shirt fabric and yanking that fabric clear up to the armpit. You can do the math yourself. Speaking of clothes to wear to the range, I hope we've all figured out by now that shooting semi-automatic firearms puts hot brass into the air around us. Actually, that's not quite true. Shooting semi-autos puts hot brass everywhere, not just into the air. Somewhere around here I've got a picture of a friend of mine with a piece of brass perched jauntily atop her ear muffs. How cute! Not quite so cute, however, when that same friendly piece of brass decides to snuggle up next to a delicate patch of bare skin. As much as is practicable, wear closed-top shirts to the range. If you wear a button down shirt to the range, button the top button until you're done shooting. If a piece of hot brass goes down your shirt anyway, keep the muzzle of your firearm pointed downrange. Calmly set the gun down on the bench. With the firearm safely secured, then and only then may you perform the ritual Dance of Burning Flesh, sometimes called the Bra-Zillian Line Dance or the Cha-Cha. Traditionally, this informal dance is performed solely for the benefit of the dancer, not for the enjoyment of the spectators. Despite this, less-informed audiences may react with audible appreciation for the performance. It is generally considered poor form to applaud, but a quiet chuckle or even shrill whistles of approval still occur today in some venues. Tea tree oil works great for burns. So there you have it. Lots of embarrassing things can happen to women who carry or practice regularly. A little foresight and planning can help you avoid many of these mishaps, but if something embarrassing does happen to you, the only sensible thing to do is deal with the issue as best you can. Nobody in the world has ever died of embarrassment, no matter how badly they wished they could at the time.